Conference and event season is in full swing and the the end of year is approaching—which means most companies are making decisions about the booths and kiosks, custom gifts and the crucial engagement strategies that connect them with their customers right now. We have good news: we’re here to help! Drawing on our successful collaborations with and client work for major brands including Twitter Canada, Deloitte, Bell Media, The City of Toronto, RBC, and others, we have compiled a Bespoke Marketing kit with ideas for myriad custom-designed objects. Custom signage, lanyards and name tags, awards, custom displays—we use 3D printing, laser cutting, and laser engraving to craft imaginative designs for all these situations. 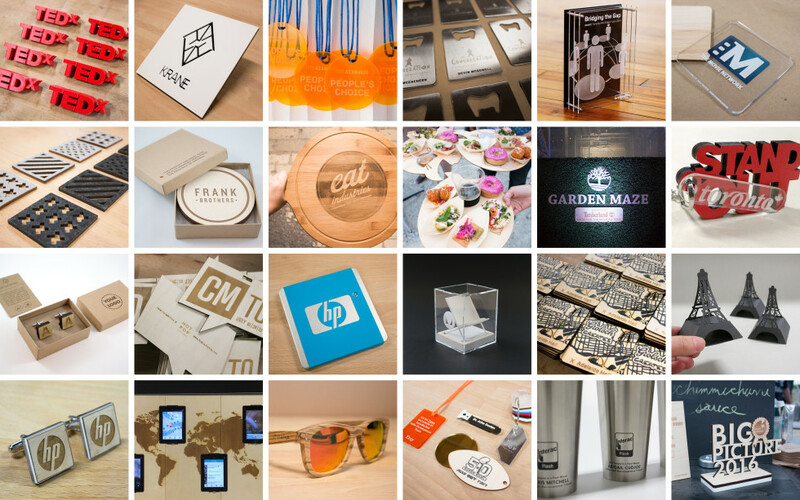 Colourful 3D printed name plates, sleek wood and acrylic awards, custom kiosks that wow (but also fold up for easy shipping), smartly lettered laser engraved signage, clever and memorable gifts—we’ve documented a range of event and marketing ideas for you to draw inspiration from. In working with us to develop your idea you’ll be harnessing cutting edge technology, a deep commitment to craftsmanship, and fast and attentive local service. Want access to our kit and dozens of ideas for event design and custom gifts? Sign up, we’ll send you a copy.